My parking brake isn't engaging anymore. 88 Hatch. Is there an adjuster on the handbrake, under the console? 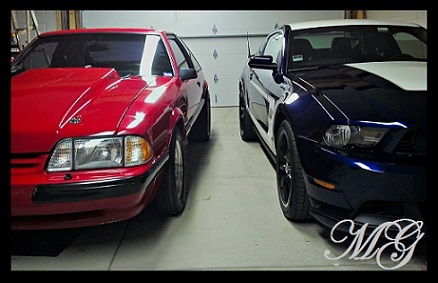 I drive a Prius.... and an 88 Mustang GT. Guess which one is more fun. If I remember correctly, the handle is self adjusting. You are going to have to get under the car and take a look at the center cable that attaches to the handle. I think that cable has a threaded rod that can be adjusted. It's been awhile since I've looked at e-brake cables though so I don't remember for certain. I bought ebrake cables for my car but still haven't installed them after I did a rear disc brake swap lol. Only stock adjustment is in the handle itself self adjusting. Rear discs you weld the self adjusting feature and add the adjustable link and different rear cables. The hand brake still barely works at full pull, I guess, but nothing to stop the car from moving on a slight incline. It was a rather sudden change. Probably original drums and maybe they are super worn or I broke a cable? I'll climb under there when I get a chance and try to find that adjuster. I have pretty much all I need to make a change to rear disc except for some things to hook up the lines and actually knowing what I'm doing. Probably should just put time into that.